Dive School in Berkshire for PADI Open Water Course - LEARN TO DIVE with "idiveteam"
The PADI Open Water Course is the worlds most popular scuba course. It has introduced millions of people to the adventurous diving lifestyle. The PADI Open Water Referral Course is perfect if you are going on holiday and want to get the majority of the PADI Open Water Course done before travelling. This means you don't have to sit in the classroom, study or dive in the pool on your hard earned break. This also guarantees that you receive the highest level of diver training before doing your 4 qualifying open water dives in clear, warm water to gain your full certification. There are lots of options from the traditional manuals and dive tables to digital products (eLearning) or downloading the course onto a tablet (PADI Touch). We tailor make this for you to best suit your individual needs - Caroline will help you when booking. Please note: If eLearning course materials are purchased direct from PADI site an additional 20% will be added at checkout. All Open Water Referral courses include Mask, fins, snorkel, wet suit, regulator, bcd, tank, weights and air. Please feel free to bring your own kit along, If you would like purchase mask, fins and snorkels we have them in stock or we can get you discounted rates on most major brands. 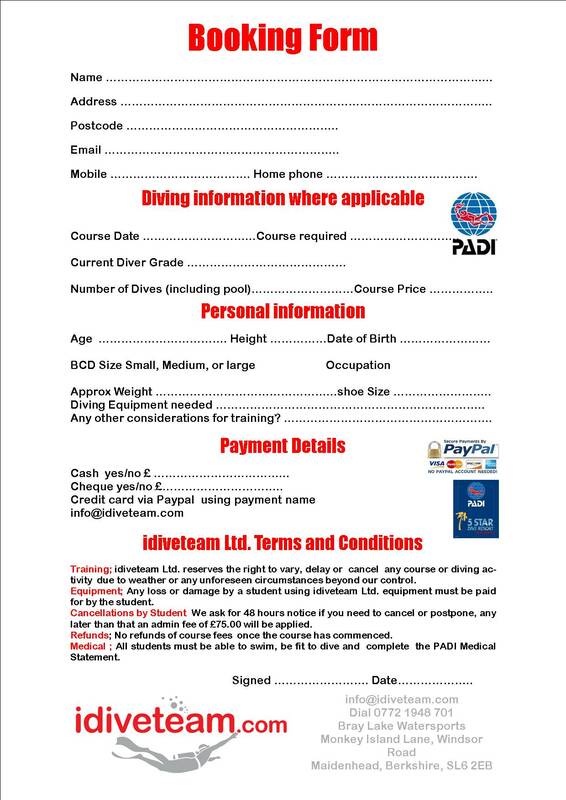 To complete the full PADI Open Water Diver course in the UK we add 2 days diving in open water. This consists of 4 qualifying dives which we usually do over a weekend. The Open Water Diver Course includes Mask, fins, snorkel, regulator, bcd, tank, weights and a full tank of air. We have a selection of semi-dry suits for average sizes (small to XXL) for your qualifying dives here in the UK for a nominal fee of £ 15 for the weekend.